Scientists have introduced a novel method of administering brain stimulation that requires no implants or external connections. By injecting magnetic nanoparticles into the brain, researchers have found that they can manipulate neurons by applying external magnetic fields. Currently, deep brain stimulation (DBS) uses electrodes that are connected by a wire to a device placed under the skin of the patient’s chest. According to the Mayo Clinic, DBS is used to treat a variety of neurological conditions including essential tremor and Parkinson’s disease. Patients who undergo DBS cannot manage their symptoms with medications. While DBS has proven effective in assuaging the debilitating symptoms of Parkinson’s, it is reserved by clinicians as a last resort because of the device’s invasiveness and subsequent risk of stroke or infection. Experts have been researching ways to give the treatment a technical overhaul. A team at MIT has been exploring the potential of magnetism to do away with the wires or implanted electrodes typically associated in DBS. Though transcranial magnetic stimulation is already in clinical use, it is only effective on brain tissue nearest to the surface. For maximum effect against hard to manage symptoms, the team is exploring ways to go deeper. The researchers developed a system that involves an injection of iron oxide particles that are subjected to an external alternating magnetic field. According to an MIT News story, these particles are capable of deep penetration of brain tissue and rapidly heat up under the influence of the magnetic fields, stimulating nerve cells. Polina Anikeeva, the lead scientist of a study published in Science, reports that without external influence, the nanoparticles can remain inside the brain for long periods of time, which makes the method a feasible treatment for chronic symptoms. “By calibrating the delivered thermal dosage, we can excite neurons without killing them. The magnetic nanoparticles also have been used for decades as contrast agents in MRI scans, so they are considered relatively safe in the human body,” Anikeeva told MIT News. The research is still in its early stages, and the new method has a long way to go before it could safely be tested on humans. Anikeeva says she plans to do further research on its behavioral impact in animal models to assess potential side effects of the treatment. “The new method is significant in that it is relatively more easily administered and induces less brain-tissue responses compared to electrode implantation. 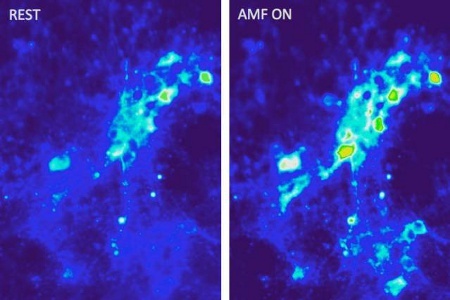 More importantly, the stimulation could be remotely controlled, a highly appealing feature for deep brain stimulation,” said Bianxiao Cui, a chemistry professor at Stanford University.